Still need to sort your Christmas food? We’ll deliver your whole organic feast in one box, in time for the big day. 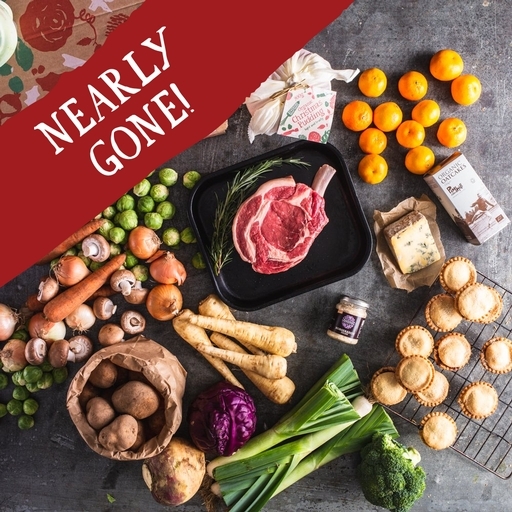 It’s packed with everything you need: a large festive veg box, 2.75g French-trimmed rib of beef from grass-fed West Country herds, and punchy horseradish relish. Dessert is 12 mince pies, a large Christmas pudding and 1kg clementines. And to finish, oatcakes and award-winning Cropwell Bishop stilton. Feeds 6-8 generously, with plenty of leftovers. You’ll find even more festive treats in our online shop. Meat storage: Keep in the fridge and use by the date on the label. Beef can be frozen on the day of delivery. Minimum use by date 26th December. Veg is grown by us, or by small family farmers we support for the long term. Organic beef comes from a small group of West Country family farmers. Mince pies and Christmas puddings are handmade to our recipes by The Authentic Bread Company and Crosbies. Stilton is from the Cropwell Bishop creamery, and oatcakes are Pimhill’s finest. Horseradish relish: Horseradish (66%), cider vinegar, water*, sunflower oil, apple juice conentrate, sea salt*, guar gum*.